It’s been a record-breaking year with 20 teams entered from across the country, including teams from East Anglia and the north-east for the first time, mingling with previous winners in the great setting of the Grosvenor Casino in Manchester. And after a long day’s play with 240 five-pointers completed, London Players’ League A – Peter Bennet, Aref Alipour, Raj Jansari, Lawrence Powell and Geoff Oliver – emerged victorious and bring the Tutchings Trophy home with them. LPL certainly have a formidable record, being semi-finalists in 2015, and winners in 2012 with four of the same squad as this time, and started out as hot favourites alongside grandmaster-packed Bristol A. This year, with five groups in the initial stage, coming second in the group was no guarantee of progress and every match in the rubber could potentially settle a tie-break. Indeed, only two teams emerged undefeated from the groups – newcomers Lowestoft and the local Jackgammon team. London A headed their group but a 3-2 defeat to Yorkshire meant they relied on match count to go through; St Albans B outdid their senior squad to top their group and knock Bristol A out, and North West League won the final group. St Albans A, NEBA A and Manchester A picked up the three best-second-place slots to make up the main knockout. The final – London (right) lead 2-1 with two to finish. The day was notable for close rubbers, and all in the main knockout went 3-2. The semi-finals set up two north-south clashes with North West v St Albans A and London v Jackgammon. Meanwhile the remaining twelve teams were in the consolation knockout. Unluckiest draw of the day went to Worcester Warriors and Worcester Royals who ended up meeting each other in the first round of the consolation. Bristol A (Cecilia Sparke, Chris Rogers, Gaz Owen, Seb Wilkinson and Julian Fetterlein) made up for their earlier mishap by winning the consolation in style with a 5-0 rout of NEBA B.
Appropriately for a day of tough play, the final rubber went down to the final match and the final point – and it was left to Peter Bennet to wrap up a 5-4 win over Mark Calderbank to send the title south. Congratulations to all and many thanks to everyone who helped make the day a success. You can find full results at Challonge.com: Groups, main and consolation. Really enjoyed the day. Well organised and being local (and possibly biased) the venue was great. I thought having 5 point matches was vindicated in that the really strong teams did not have things all their own way and the ones who did well had to work hard for their well deserved success. The 4 matches we played all ended 3-2 for or against which may be a microcosm of a narrowing gap between teams. Congratulations to London who were worthy winners. Great performances as well by the Jackgammon, Lowestoft, and Neba teams. Thanks to Ian and his ‘helpers’ for organising a great event. Thanks also to the Grosvenor Casino Didsbury, especially Jonasz, for hosting the event at a great venue. Thank you so much for Ian Tarr, Kevin Jonese and Annette all did a great job. A very good venue and efficient services. My extra thanks to Ian’s car lift, without it I’d missed you all. I enjoyed being there with you guys, all losers and winners. It was lots of fun on Saturday. There was a lot of questions and debate going into the event and I’m sure these matters will be taken on board. I feel that making the matches 7 points would go a long way to removing most of the luck from proceedings. Maybe 5 points is still a bit too short and 7 points wouldn’t take that much longer? Congratulations to London and roll on 2017! Sunday…… It’s been a long week. I thought the format was perfect for the time available. The final was contested between who I considered the second and third favourites before the event and the shock was Bristol A didnt get into knockout stage, thats why I prefer backgammon to chess. Lowestoft and Jackgammon were able to surprise some with the quality of their play and I am sure other clubs will in the near future. Congratulations to Ian and Kev for the format, and to Annette and John Wright who also helped as well I believe, hope I havent left anyone out. Well done guys does that mean it will be in London next year hopefully get a team from us Southern players either Brighton or Bognor.. Thanks Aref and well done to the London Players League team for winning the trophy. North West for the second year running lost in the DMP game of the deciding match, third time lucky next year? Thanks to Kev, John, Mark and our captain Dorothy, so close!! 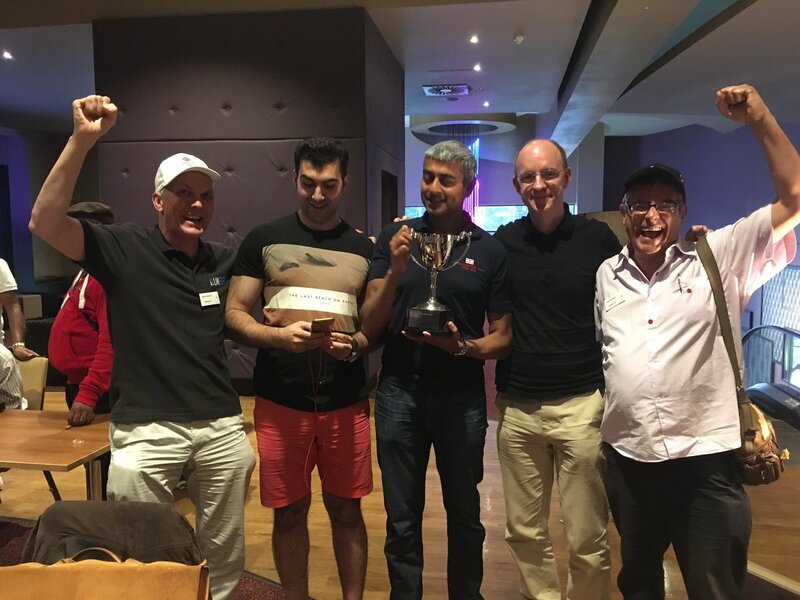 It sometimes feels the there is too much luck in backgammon but more often than not the cream rises to the top, congratulations Raj, Aref,Geoff,Peter and Lawrence. 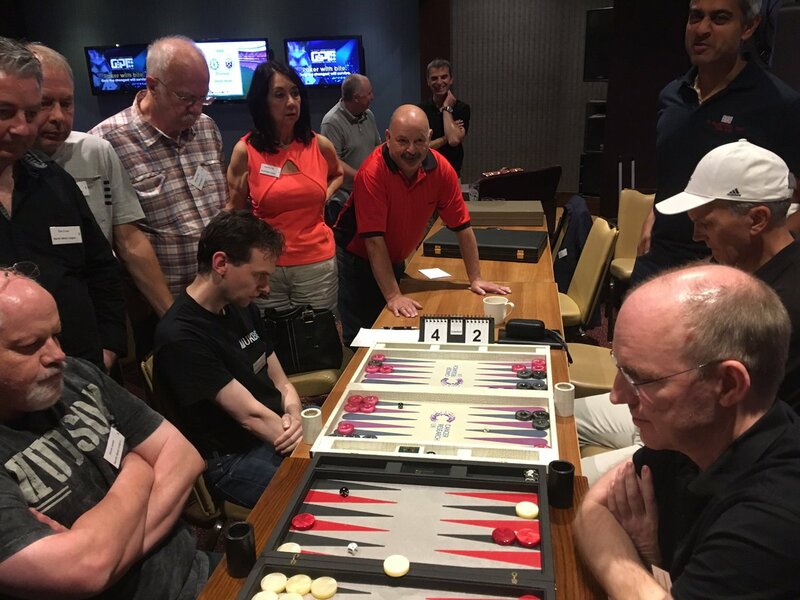 Great performance by our final opponents and massive thanks to Ian Tarr, Kevin Jones and his daughter Annette for organising a great day for UK backgammon. And finally a big thanks to my team, Raj, Peter, Geoff and Lawrence for their tremendous achievement and performance. A huge thanks to the organisers – Ian Tarr, Kevin Jones and Annette did a wonderful job. Thank you also to all of the players and teams that participated. A hundred players shows that one of the goals of the UKBGF being to help create new clubs and hence bring in new players to our wonderful game is working. Onwards and upwards! PS – winning is nice but that is just a bonus – it is the partcipation and the spirit in which we all meet up, play and enjoy the occasion that really counts. There can only be one winner and that is often based very much on luck but there are many teams and without all those teams playing in the right spirit to create a great event, the whole experience would be very much devalued.